The Wastewood Large Shelf from Moe's Home Collection delivers an excellent mix of fashion and function. It is constructed from waste wood that gives the piece a natural look and feel. Pick up a top-notch shelf that is both stylish and practical with the Wastewood Large Shelf. Constructed from waste wood that gives the shelf a distinct look and feel. Ideal for displaying books or knick-knacks. Shelf offers a practical storage option as well as a stylish decoration. 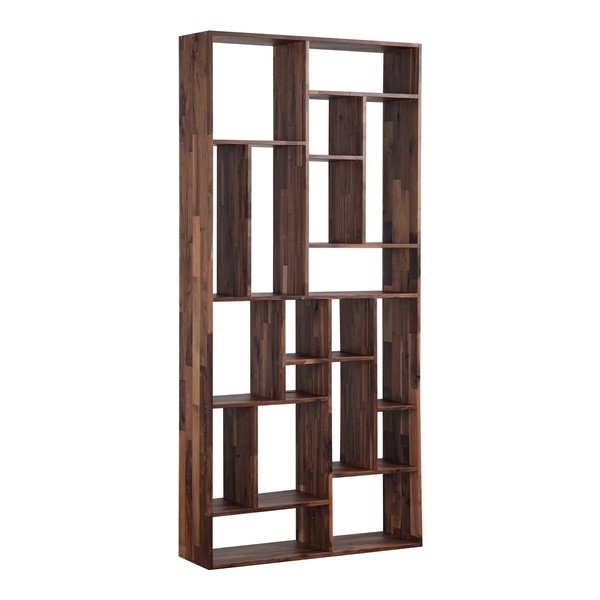 Can I place this item on its side and use as a low bookcase / room divider? There are 4 small rubber grips on the bottom side of this unit. The shelf can be used on it's side to be displayed horizontally, but these 4 small rubber grips would be present on one side of the unit.